Robbie Avenaim, Motorgenic at The Substation, 2016. This event explores the concept of nothingness in scientific inquiry, sustainability, literature and cultures that express that they ‘do nothing’. Seems vague? It’s nothing to worry about. This symposium brings together leading academics, thinkers and experimental artists to delve and dive, to poke and prod and explain to you, the very idea of nothingness. On the night, international law scholar Hilary Charlesworth AM will discuss the role of utopia (‘no place’) in international law; Dr Mark McMillan—a Wiradjuri man from Trangie, NSW— who researches in the area of human rights and will present you with all or nothing… unpacking Indigenous indifference to being legally “nothing”; founder and co-editor of the Lost Plays Database and lecturer in Shakespeare Studies Dr David McInnis will explore the clues to lost plays that can be found in those which survive – clues to existence when nothing remains; Lecturer in the Graduate School of Education at the University of Melbourne, and former astrophysicist, Dr Maurizio Toscano will draw from the science of human consciousness, from the worlds of particle physics, cosmology and field theory to illustrate how nothing is the authentic source of the scientific imagination; Dr Trent Brown, research assistant at the Australia India Institute, will speak about how nothing has a power that we overlook in our relentless attempts to ‘do something’ and ‘be something’ using discussions on sustainability and food production; Oxford University’s Associate Professor in German and Comparative Literature Professor Barry Murnane will speak about how literature’s nothingness is extremely productive, how writing allows nothingness to at least be evoked or somehow approximated within its fictional medium; Finally, rounding out the panel, director of the Australia-India Institute, Craig Jeffrey will enunciate how young people in northern India refer to themselves as ‘doing nothing’. Come along to this event—it’s sure to be something. 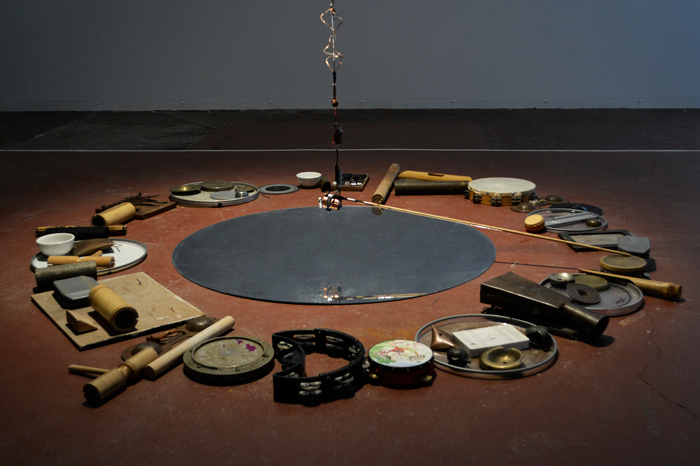 Within this event will be a sound installation where percussion is performed by nothing—a semi-automatic percussion system by sound artist Robbie Avenaim—and at the conclusion of the talk musician and producer Lisa Lerkenfeldt will be play a selection of music about nothing. This event has been made possible by the Australia India Institute and the Hugh D T Williamson Foundation through funding for MPavilion’s series of events looking at design & science. You can revisit this talk at our library page.